Much of the content of our website is based on the teachings of H. P. Blavatsky, to whom the world owes a debt so great that it can never be repaid—except with deepest respect and gratitude for the wonderful Service she has rendered to all genuine seekers after Truth. It is our firm conviction that all Blavatsky's books are well-worth studying if you wish to obtain a thorough understanding of the spiritual and the material world. We emphasise 'material' deliberately, for unless we thoroughly grasp the real meaning of the material, the Spiritual will remain a closed book to us. Blavatsky was the first occultist to thoroughly investigate the material sciences of physics, chemistry, biology, geology and astronomy. In Isis Unveiled and The Secret Doctrine—both reviewed below—she discusses the real nature of gravity, energy, electricity and magnetism—forces which are still poorly understood by scientists today. You can read more about this remarkable woman in the sidebar on your right, as well as on our Wisdom on the Web page. Also in the sidebar, you will find short reviews of a few of the many biographies written about her since her death in 1891. Finally, those who doubt the motives, sincerity and probity of H. P. Blavatsky and her teachings or worse, insist on regarding her as a plagiarist and devil-worshipping racist, are encouraged to read our answer to the calumnies and accusations made against her. Softcover, 370pps plus Index, 53pps. Theosophical University Press, Pasadena, California, USA, 1972/87. Unabridged, verbatim reprint of the original edition of 1889. ISBN 978-0-7229-5063-0. Softcover. Available used from as little as £3.00. Newer editions may be incomplete: see note accompanying our review of Isis Unveiled below. For those who are daunted by the sheer size and complexity of H.P. Blavatsky's two masterworks (Isis Unveiled and The Secret Doctrine—both reviewed below), this book is an excellent introduction to the ancient Wisdom she first brought to the attention of a Western audience. Written in direct response to the many questions about the ancient Wisdom put to her by her students in the form of questions and answers, the book unfolds the fundamental principles of occult science in clear and easily understood language. The many subjects covered include: the septenary constitution of man, evolution and illusion, the difference between soul and spirit, what memory really is, past lives, reincarnation, post-mortem and post-natal consciousness, karma; spiritualism, what happens after death, prayer, charity, asceticism, marriage, the masters of wisdom, and the fundamental unity of all things. But here we must issue a cautionary note. Not every answer in this book is without error. 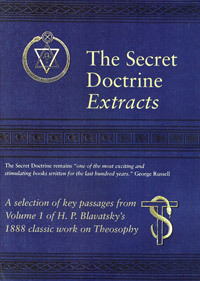 Unlike The Secret Doctrine (reviewed below), the 'Key' was written for a very mixed audience, many of whom had little or no concept of the truths Blavatsky was trying to expound and were most reluctant to make the necessary changes in their thinking and habits to assimilate these truths and apply them in their daily lives. Consequently, she employed the time-honoured tools of every genuine teacher to get her message across, and these often meant pitching her answers in a key her students would understand and respond to. We touch on this in our article on vegetarianism and spirituality. The book contains a 61 page glossary of religious, philosophical and occult terms, including definitions of many obscure Sanskrit words, which readers unfamiliar with the subjects discussed will find extremely useful. 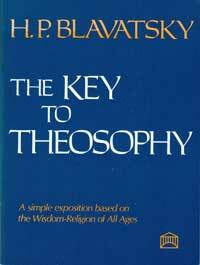 Readers should NOT be put off by the word 'theosophy', which simply means the 'wisdom of God', that is Divine Knowledge or Science. Whilst the book was written at the request of some members of the Theosophical Society, and is studied by the Society's members to this day, it is emphatically not a 'publicity' tract for the Theosophical Society, nor was it intended solely for its members. On the contrary, this masterly exposition of the Wisdom of the Ages should appeal to all genuine seekers after Truth, and as such, we heartily recommend it to them. NOTE. There is an abridged version of this book edited by Joy Mills, published in 1972, which at 194 pages, contains less than 50% of Blavatsky's original text. For this reason we recommend that you obtain the unabridged, verbatim edition described. See also our notes accompanying the reviews of Isis Unveiled and the Secret Doctrine below. ISBN 978-0-8356-0247-1. Softcover, price new $39.95. Verbatim with the original edition of 1877. Also available second-hand from Abe Books and other booksellers from as little as £10.00. digitised text also available to read online at The Theosophical Society Pasadena, California, USA. The sub-title of this seminal work on the age-old wisdom says all in a few words. If we take just about any modern scientific 'discovery' we will invariably find that it is covered in considerably more detail and with much greater accuracy in this book. The same applies to magic, mysticism and so-called 'New Age' thought. Indeed, it is true to say that Isis Unveiled contains more original and accurate information on a vast range of scientific, psychological, philosophical, theological and occult subjects than any other book published in the last few centuries. The title of the book is somewhat misleading. It was never intended to unveil the Egyptian goddess who here represents the wisdom imparted in secret to the trusted Initiates of the Ancient Mysteries. Blavatsky's original title was The Veil of Isis, through which shimmering vesture the neophyte was permitted to glimpse the lesser mysteries of the goddess...and no more. But when the book was being printed, it was discovered that the title had already been used by W. Winwood Reade in 1861 for his book on the mysteries of the Druids. 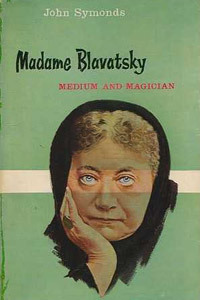 The publisher suggested Blavatsky change her title to Isis Unveiled, to which she reluctantly agreed, though the various facsimiles of the first edition still bear her original, and more apt title, at the head of every page! Isis Unveiled first made known to the modern world the existence of the once-universal Wisdom-Religion. In doing so, it not only demonstrated that science does not have all the answers, but that the ancients were in possession of hidden knowledge as yet undiscovered by any scientists. 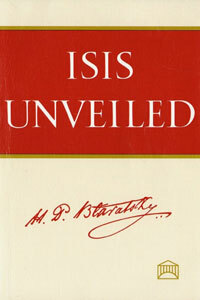 In this connection it must be remembered that when Isis Unveiled was published in 1877, there were no books to be had that contained anything more than the skeletal remains of this Wisdom; only broken shards of the shining Mirror of Truth remained, each incomplete fragment of which was interpreted in diverse ways by minds of variable ability (and mixed motives) who had long since lost the keys to the secrets of the goddess Wisdom. It is impossible in a short notice such as this to begin to do justice to the wealth of information in this book, but the following subjects should give the reader some idea of the vast range of themes it embraces: physics, chemistry, biology, geology and astronomy; energy, force, matter, electricity and magnetism; alchemy, astrology and magic; psychic phenomena and spiritualism; time, space and eternity; the world soul and what it is; vital force, elementals and elementaries; vampirism; miracles; healing; hypnotism; clairvoyance, clairaudience and psychometry; the origins of Christianity; sorcery, witchcraft and black magic; who Jesus really was; kabala; gnostics and gnosticism; the Vedas, Puranas and Upanishads; Buddha; world Saviours; true seership and true religion. Any one of these subjects might fill several books, and we may say, often have, without their authors acknowledging the source of their misappropriated information and pretended erudition! Finally, we feel it is important to add that Isis Unveiled forms an integral part of one complete revelation and should be studied together with The Secret Doctrine (reviewed below), which it both elucidates and presages. IMPORTANT NOTE! Several 'abridged' editions of Isis Unveiled are now in print. One of these 'new' versions, published in 1997, claims to have "stripped the book of its lengthy quotations from other writers and its repetitious commentary". Words fail us! It is just such presumptuous and inept meddling that is responsible for the parlous state of nearly every inspired text that has come down to us. For this reason we cannot recommend the 'improved' editions produced by Michael Gomes and others in recent years. A selection of key passages from Volume 1 of The Secret Doctrine. Theosophy Company Limited 2017. ISBN 978-99557358-1-1. 116pps, softcover, price new £5.00. + P&P. FREE PDF available to download from United Lodge of Theosophists. These selections from The Secret Doctrine (reviewed below) provide easy access to over 100 pages of its key passages and are gathered together in this convenient form for the benefit of those who are daunted by the sheer size and complexity of H. P. Blavatsky's master-work. The extracts in this new book are photographic facsimiles of the original edition of 1888 and comprise the Publisher's Preface, Blavatsky's own introduction, Proem and Summing Up to The Secret Doctrine, and all the Stanzas from the Book of Dzyan included in Volume 1. Also included are the "Evolution of Consciousness" diagram from Volume 1, p200 of The Secret Doctrine and the Publisher's Notes on it. The careful study of these extracts will provide the diligent reader with a sound introduction to the universal philosophy of Occult Science expounded by H. P. Blavatsky. Those readers who are as fed up with cheap, mass-market paperbacks as we are, will be pleased to know that this affordable edition is smith-sewn, meaning the pages won't fall out after a few months or even years of use! The Synthesis of Science, Religion and Philosophy. 2 vols. 1571pps. Theosophical University Press, USA. Unabridged Verbatim Edition. A reproduction of the original 1888 edition in new type. Hardcover ISBN 978-1-55700-001-9. Price US$50.00. Paperback ISBN 978-1-55700-228-01984. Price US$36.00. Also available second-hand from Abe Books and other booksellers from as little as £15.00. These words are as true and relevant today as when she wrote them more than 120 years ago. The book directly addresses and answers the age-old questions: the origin and purpose of Life on earth, the creation and evolution of the Universe, the continuity of life after death, the problem of good and evil, and the nature of consciousness. Based on the archaic Stanzas of Dzyan with corroborating testimony from over 1,200 literary and scientific sources, The Secret Doctrine reveals and elucidates the Ancient Mysteries and unlocks the hidden language of myth, symbol and allegory, helping the student to comprehend the hidden meaning concealed beneath the often abstruse symbolism of the world's sacred literature. The Secret Doctrine is not an "easy" book to read for those with little or no occult knowledge. The fact is that it was NEVER intended for such, or even for the majority of 'occultists' and 'mystics'. Among which we find all too many who wish to have their own pet fancies and fantasies confirmed, rather than learn the Wisdom of the Ages Blavatsky expounds in this book. It is certainly not a book to be read through casually like any ordinary book. It requires slow, careful, and preferably meditative, study over many years. But for the few who are genuinely in search of Truth, the Light that shines from the golden leaves of the The Secret Doctrine will be a revelation that will open the door to a hitherto undreamed of world of wisdom, beauty and wonder; constituting an edifice of unbelievable grandeur and sublimity. For those who find the book too 'difficult', or worse, will insist upon associating it with "racist" conspiracy fantasies, there are plenty of more "colourful" occult books which may be more to their taste. If you are unsure which edition of The Secret Doctrine to buy, we suggest that you read the following notes on the different editions of this book before making your purchase. 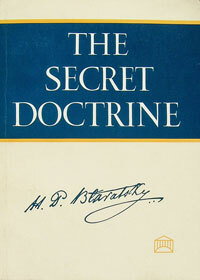 Several different editions of The Secret Doctrine have been produced since the book was originally published in 1888. One such is the three volume edition issued in 1897 by the Theosophical Society in Adyar, India. A group of Theosophists who compared this 'third and revised edition' edited by Annie Besant and G. R. S. Mead with the original 2 volume edition of 1888 found no less than twenty thousand changes. Although many of these alterations are trivial some of them are sufficiently serious to warrant the conclusion that Besant deliberately and intentionally altered and distorted the original text for her own, questionable purposes. You can read more about the spurious 'third volume' of this edition elsewhere on the Internet. More recent editions include the abridged paperback by Michael Gomes published in 2009 by Jeremy P. Tarcher (shown at left). This runs to a mere 288 pages, barely 20% of Blavatsky's original text! The publisher's advertisement for this edition contains inaccuracies and misstatements that simply cannot be allowed to pass unremarked. The claim that the book has previously only been available "in expensive, two-volume editions of some 1,400 pages" is factually untrue. Many facsimiles of the original edition of 1888 have been continuously in print for more than 100 years. What is more, the edition we review above has been in print for over forty years as the worn copy we bought in 1974 testifies! Moreover, the Theosophical University Press (TUP) also provide FREE e-book and PDF editions of their printed book to read and download. Far from placing Blavatsky's master-work "within reach of all who are curious"—to use the publisher's own phrase—they are charging readers the princely sum of £16 for their edition when the "curious" can read the original for nothing! The publisher goes on to say: "Gomes scrupulously scales down the book's key writings on symbolism to their essentials." We are tempted to ask how Gomes knows these 'essentials' when Blavatsky apparently did not? Had she done so she would presumably have 'scaled them down' herself. The implied inference cannot be avoided that Gomes considers himself both wiser and more capable than the author whose work he has 'edited.' A less charitable view might be that in cutting nearly 80% of Blavatsky's text, Gomes has ably succeeded in turning a silk purse into a sow's ear. Does any intelligent reader imagine for one moment that an author of H. P. Blavatsky's immense erudition and dedication to verisimilitude included her many detailed explanations of occult symbolism simply to pad out the book? Or that she included so many references and annotations simply out of pedantic malice toward her future readers? No doubt Michael Gomes means well and had the best of motives in producing this book to appeal to a wider audience. Whether Blavatsky ever intended her master-work to appeal to the merely 'curious' is open to question. On the evidence of Blavatsky's own letters and writings she did not expect more than a tiny handful of readers to appreciate the profound Truths she revealed in The Secret Doctrine, and even fewer to comprehend them. In October 2016 a 'new' paperback edition of The Secret Doctrine was published by TarcherPerigree (shown at left). Whilst it appears to be complete, we cannot help but question the motivation for issuing this edition when, as we point out above, a perfectly good (and cheaper) alternative has been continuously in print for more than forty years! We begin this brief review of TarcherPerigree's edition with the caveat that we have not seen a copy of it. We base our comments solely on the preview Amazon provide. The first thing we noticed was a typographical error which does not bode well for the authenticity of this edition. On the dedication page a capital 'A' is used in place of the capital 'I' in the original edition of 1888: 'This work A (sic) Dedicate to all True Theosophists...' The fact that the dedication in the original is in Gothic script does not excuse this glaring error on a page that contains just 5 lines of text and appears at the very beginning of the book! The Preface and Table of Contents, however, are verbatim with the original edition, though again, the footnote at the end of the contents refers the reader to Volume II for the Index and Glossary, presumably because this note was copied from the original edition which was issued in 2 volumes! Whilst the publisher's claim that their new edition is 'complete and unabridged' may well be justified, these elementary mistakes do not inspire confidence that in re-setting the book they have not introduced further errors and omissions of their own. Moreover, the Index which Amazon's preview shows differs markedly from that in the original edition of 1888. For all these reasons caveat emptor (buyer beware) applies! 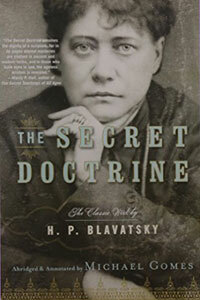 Many of the more recent editions of The Secret Doctrine may have been published with the best of intentions, but the net result of all these 'adaptations', 'abridgements' and editorial meddling has resulted in the distortion and misrepresentation of H. P. Blavatsky's master-work. For all these reasons we strongly recommend that if you wish to read what Blavatsky actually wrote, as opposed to what her followers think she wrote, or modern 'editors' would like her to have written, you obtain the verbatim, unabridged edition published by the TUP. Theosophical University Press, USA. 1987. ISBN-13: 978-0911500080. 212 pps. Hardcover $20.00. Also available new from £3.00 from Amazon and various booksellers in the UK and USA. Studies in Occultism is a collection of articles from Lucifer, H. P. Blavatsky's magazine, published between 1887-1891, the year of her death. 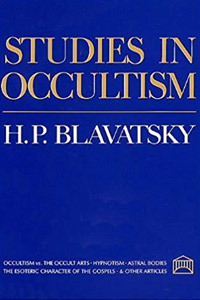 In them, Blavatsky clarifies the essential difference between theoretical and practical Occultism and the vast gulf that separates the harmful occult practices of the left-hand-path from the right-hand-path of altruism and service to humanity. The many subjects discussed include practical occultism versus the magical arts, Hypnotism, black magic in Science, cosmic consciousness, the dual aspect of Wisdom, the astral body and the true constitution of man as a material and spiritual being. 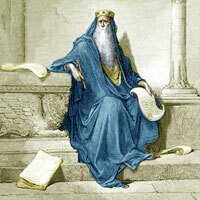 Also included is an in-depth three-part article on 'The Esoteric Character of the Gospels' which shines a revealing light on the mystery of Jesus—both as a man and as the embodiment of the Christ principle which John Temple discusses in his series of articles on the Search for Truth and the hidden wisdom in the Bible. Theosophical University Press / Quest Books, USA. 1966-1985. 15 volumes including index (Vol. 15), hardcover. Price new per volume $29.95. Complete set of all 15 volumes available new from £185.00 from various booksellers in the UK and USA. 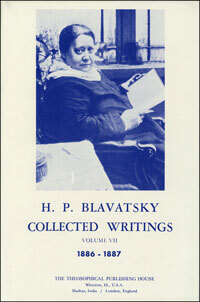 The Collected Writings comprise 14 volumes (15 plus comprehensive index) containing Blavatsky's many articles, letters to the press and short stories, all written during a period of 16 years from 1875 to 1891, the year she died. These unique writings provide clear answers to many questions dealing with force, energy, matter, spirit, psychic phenomena, astral bodies, magic, astrology, reincarnation, who Jesus really was, the origins of Christianity, and a host of other topics of interest to the sincere seeker. Many of these articles could have been written today as they deal with such topical themes as scientific arrogance, rampant materialism, spiritualism, séances, channeling, and the abuse of psychic abilities. 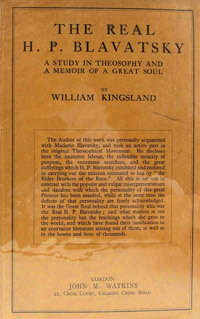 The Collected Writings contain many biographical sketches of the leading scholars and occultists of the 19th century, including J. Ralston Skinner, C. W. King, Gerald Massey and Franz Hartmann, as well as the inventor, John W. Keely and G. R. S. Mead, Madame Blavatsky's last private secretary and renowned Gnostic scholar. Theosophy Company Limited 2017. ISBN 978-0-9957358 04. Price new £ 6.50. + P&P. 112pps. Hardcover, facsimile reprint verbatim with the original first edition of 1889. This little book, the last that Blavatsky wrote before she died, is taken from The Book of the Golden Precepts, one of the works put into the hands of occult students in the East. 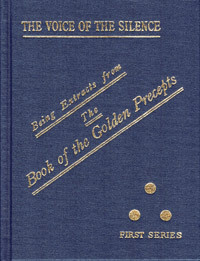 The book contains three Fragments—"The Voice of the Silence," "The Two Paths," and "The Seven Portals"—which together comprise about 90 distinct treatises on the Occult Sciences, from which the author has selected those which she felt would most benefit the few sincere seekers in the West who could comprehend and apply the elevated teachings contained in them. The whole presents the lofty ideal of the path to the Light and its virtues of compassion, altruism, self-sacrifice, and service to humanity. As such, it should appeal to every kind of seeker who wishes to lead a more useful and happy life, which, by force of example, will help mankind in general along its path of more or less blind existence. This new edition, published by the United Lodge of Theosophists (ULT) in 2017, is a photographic facsimile of the original 1889 edition. The pages are smith sewn (meaning they won't fall out!) bound inside a gold-embossed sturdy hard cover that will stand years of use; quite a rarity in these days of mass-market paperbacks, all for the very affordable price of £6.50 plus postage and packing. The Voice of the Silence is both easy and difficult to read. Easy, because it presents the two paths of spiritual attainment—one pursued by those seeking knowledge for their own enlightenment; the other by those prompted by love and compassion for all—with great simplicity and clarity. Difficult, because of the large number of Sanskrit terms employed by the author, many of which will be unfamiliar to many Western readers. However, the book contains an excellent glossary that elucidates these terms, so the diligent student should have little difficulty in familiarising himself with them. The knowledge gained in this way will also prove invaluable in the study of the Secret Doctrine reviewed above. We would add that the Sanskrit term 'lower Iddhi' used in the first Fragment refers to what we call the lower self or mind, and it is this principle in us which presents the greatest danger for the sincere seeker who wishes to truly learn and master the Occult Sciences. This page was last updated on 6 November 2018 — © Copyright occult-mysteries.org. "I have here made only a nosegay of culled flowers, and have brought nothing of my own but the string that ties them." So wrote Madame Blavatsky in the introduction to the Secret Doctrine, quoting the French philosopher and essayist, Michel de Montaigne. H. P. Blavatsky was a compendium of the Ancient Wisdom, who single-handedly re-kindled the Torch of the occult sciences, of which only ruins remained in the West when she began her work at the end of the 19th century. She was a tireless explorer for whom no barriers existed, whether it was travelling to the far corners of the world or promulgating the teachings of the Masters whom she loved and served so loyally. She was a courageous soul who confronted ignorance, fear, envy, betrayal and calumny with equanimity and compassion. She believed that these teachings would help to eradicate ignorance and superstition, uproot separateness and selfishness—the cause of so much suffering and misery in the world—and lay a sound basis for universal brotherhood. Her eventful life and the far-reaching influence she has had on modern thought are described in detail in the excellent biography—The Esoteric World of Madame Blavatsky by Daniel H. Caldwell. We review this book on occult biographies books page. She was not interested in establishing yet another sect with herself as high priestess. She made no claims to infallibility, but called for "free and fearless investigation", believing that "There is no religion higher than truth." In her view, all ideas—whatever their source—should be tested against our own knowledge, experience and intuition. We say the same in all our articles. She strove above all to reawaken interest in the timeless, soul-strengthening ideas of the ancient wisdom, because she felt that they could help us to develop a healthy and positive philosophy of life, one which satisfies both the heart and the head, and which can help us to meet the trials and temptations of daily life. Her major works Isis Unveiled, The Secret Doctrine, The Key to Theosophy and The Voice of the Silence (all reviewed on this page), have been continuously in print since her death in 1891. It is no exaggeration to say that these books contain more accurate information about the material and spiritual sciences than any others published in the last two centuries. H.P. 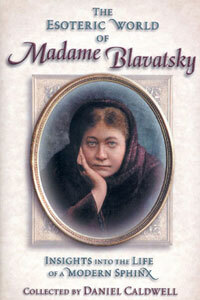 Blavatsky made Truth her only standard and maintained it as her sanctuary. She was a tireless seeker after spiritual treasures, a prolific and tenacious author, an articulate conversationalist, and true friend to all who knew her. She knew of riches and of misery, of glory and of sickness, of followers and of loneliness. She possessed the innate magic of the gifted and the penetrating vision of those who see beyond the veil of illusion. May you, who reads these words, profit from the great gift she gave to the world. Theosophical Publishing House Ltd, London 1928. 314pp with index. William Kingsland was a pupil of H. P. Blavatsky during her last years in London. His book is unusual in attempting to show the concealed Individuality behind the enigmatic personality of his subject. How well he succeeded only the reader can judge. However, it is true to say that Kingsland comes nearer to unravelling the complex and multi-faceted enigma of the remarkable woman who has been called 'the Sphinx of the 19th century'. Rider & Co., London 1937. 322pp with index. Mary Neff was an American Theosophist who worked closely with Annie Besant and was for a time the private secretary of C. W. Leadbeater, one of the 'shining lights' of the Theosophical Society. 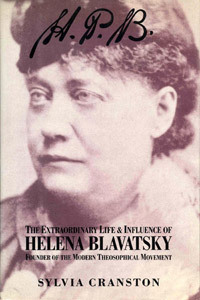 These facts might incline the reader to look with suspicion on Miss Neff's qualifications as an unbiased biographer, but that would be a mistake, for her book is a mostly accurate and detailed account of the life and teachings of H. P. Blavatsky. Symonds' biography is written in a populist style; heavy on florid prose and brimming with colourful incidents in the life of Madame Blavatsky, but short on scholarly analysis and devoid of any genuine insight into her character or mission. The publisher's claim that the book "throws new light on this astonishing woman," is a bold one that remains unfulfilled throughout its 200 odd pages. This is perhaps not surprising, since John Symonds was also the biographer, literary executor and friend of Aleister Crowley, the self-styled "Beast" and idol of contemporary 'magicians' the world over! For those in search of superficial 'cliff-notes' on Blavatsky's life this book has some merit; those who hunger for something deeper should look elsewhere for more wholesome and satisfying nourishment! Jeremy P Tarcher/Putnam, New York, USA 1993. 648pp with index. This is an altogether superior book to Symonds' earlier biography reviewed above. Sylvia Cranston (the nom de plume of Theosophist Anita Atkins, 1915-2000), gave the world the first definitive account of Madame Blavatsky's extraordinary life and work. The book is an absolute page-turner (in a way that Symonds' turgid potboiler is not!) which pieces together HPB's life and travels in a manner that is as lively as it is scholarly, with fascinating details supported by at least two independent sources for every factual statement made. For these reasons Cranston's sympathetic and well-researched biography remains the most comprehensive and detailed of all the many attempts to provide an accurate account of the life and work of H. P. Blavatsky. Quest Books, USA 2000. 350pp., illus. 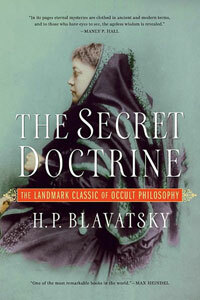 We review this book in our occult biography books section, so will not repeat ourselves except to say that this remains our personal favourite of all the recent biographies of H. P. Blavatsky. We have indicated below where to obtain the books of H. P. Blavatsky, but this information is subject to change as titles go in and out of print and/or stock and web links are updated. In most cases a web search will return results from various sellers, and it is also worthwhile contacting booksellers directly. This page lists all the occult books we have reviewed. We review a selection of the best occult fiction books of all time. We review several classic Hermetic books that should be in every occult student's library. A critical review of the books and teachings of the Czech occultist.